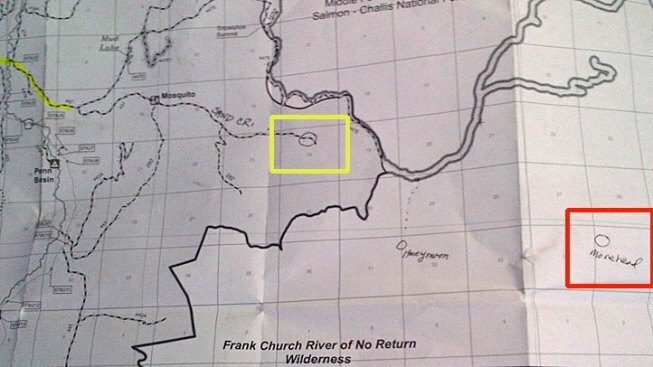 In this map of the Frank Church River of No Return Wilderness area, the yellow square shows where DiMaggio's car was found. The red square shows where the suspect's campsite was spotted. The highlighted route to the left of the map is where the dirt road ends. San Diego County Sheriff Bill Gore announced that Hannah Anderson has been found safe in Idaho backcountry. Gore confirms that kidnap and murder suspect James DiMaggio was killed in the wilderness by FBI agents. 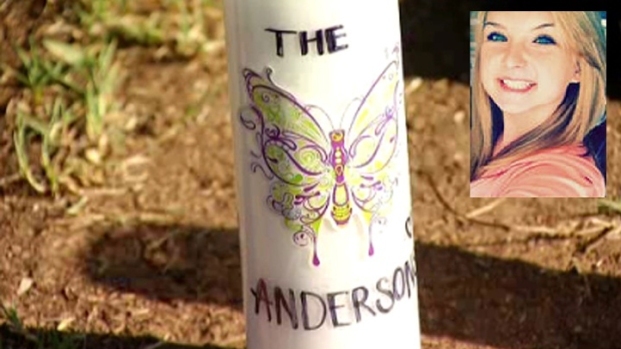 The San Diego County Sheriff’s Department confirms that the charred remains of the second victim found inside the burned out home in Boulevard are those of Hannah’s little brother, 8-year-old Ethan Anderson. Hannah’s friends hold a candlelight vigil for the teen near El Capitan High School in Lakeside. Many are hopeful for her safe return after hearing that she was spotted alive in Idaho. A possible sighting of Hannah and DiMaggio reported by a horseback rider leads officials to a rural community in Idaho known as the “River of No Return Wilderness.” This narrows the widespread Amber Alert, with investigators now focusing their search near Cascade, Idaho, approximately 80 miles north of Boise and roughly 400 miles from the Canadian border. Officials say the terrain is rugged and dangerous, and cannot be accessed by car. Officials also announce that they’ve located DiMaggio’s vehicle – the blue Nissan Versa mentioned in the Amber Alert – about six to eight miles from where the horseback rider reported seeing the pair. The car is covered in brush and the license plates are missing, but officials match it as DiMaggio’s vehicle using the VIN. Once searched, officials later determine the vehicle is not rigged with explosives. A close friend of Hannah’s says James DiMaggio became infatuated with the teen and allegedly admitted he had a crush on her. The teen also recalls a time she and Hannah stayed the night at DiMaggio’s house. San Diego officials say that evidence recovered at DiMaggio’s home suggests he may be armed with explosives either on his person or inside his Nissan Versa. The Amber Alert for Hannah and Ethan Anderson is extended to Oregon and Washington. Officials believe DiMaggio could be headed to Canada with the children. Friends and family members of missing Lakeside teenager Hannah Anderson, 16, held a vigil and prayed for the teen's safe return. Hannah is the subject of an active Amber Alert spanning six states. NBC 7's Danya Bacchus reports. San Diego County officials issue a statewide Amber Alert for Lakeside siblings Hannah Anderson, 16, and Ethan Anderson, 8, after their mother’s body is discovered inside a home that was burned to the ground in Boulevard. The children are believed to be traveling with murder and kidnap suspect James Lee DiMaggio in a blue Nissan Versa with the license plate 6WCU986. Officials announce they’re searching for suspect James Lee DiMaggio in connection with the fire in Boulevard and the murder of Christina Anderson, 44, and the child victim. Officials say the home in Boulevard belongs to DiMaggio. Investigators believe DiMaggio murdered Anderson and then set the structure on fire. Deputies are called to 2071 Ross Ave. in the unincorporated community of Boulevard near San Diego around 8 p.m. At the scene, they find a home fully engulfed in flames. Officials later discovered the charred remains of two people and a dog inside the burned out home. One of those victims is Lakeside resident Christina Anderson, 44. The second body is that of a child’s, but it’s so badly burned officials are unable to immediately identify the remains.